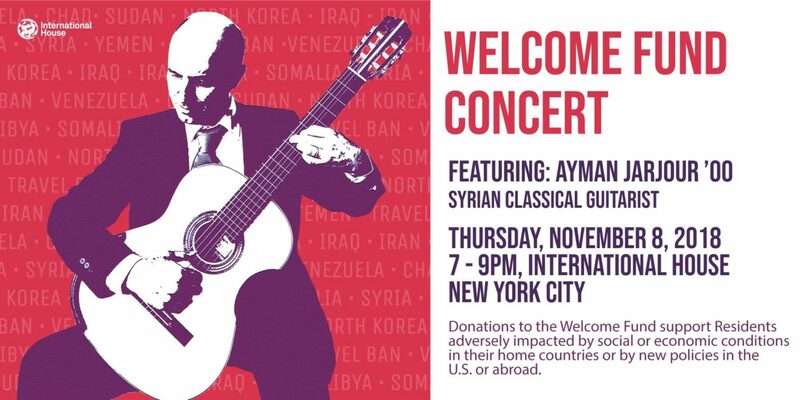 We invite you to join International House alumni, residents, and friends on Thursday, November 8th as we welcome Syrian Classical Guitarist and I-House Alumnus, Ayman Jarjour ’00 for the Welcome Fund Concert. Ayman Jarjour has traveled and performed around the world, including the Middle East, Far East, North America, Europe, and Africa, and will be returning to International House for a concert featuring a combination of solo classical guitar repertoire as well as collaborative pieces featuring current I-House resident and alumni musicians. The concert will raise awareness for The Welcome Fund. Date: Thursday, November 8th, 2018; 7:00PM-9:00 PM (doors open 7:00 PM, performance to begin at 7:30 PM). Reception to follow. The Welcome Fund Concert is free for all to attend. Pre-registration is required (below). Light hors d’oeuvres and a cash bar will be available during the reception following the concert. For questions or more information please contact Julie Pape in the Alumni Relations Office by email (jpape@ihouse-nyc.org) or phone 212-316-8425. Donations to the Welcome Fund support Residents adversely impacted by social or economic conditions in their home countries or by new policies in the U.S. or abroad. A resident from Nigeria whose savings and source of financing for his studies lost half its value following a currency devaluation. Ayman Jarjour ’00 has performed in the Middle East, Europe, the United States, Africa and the Far East. 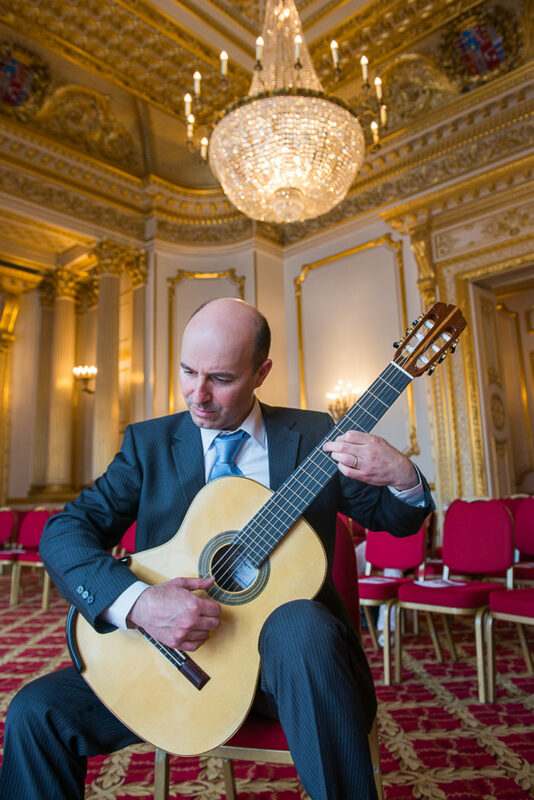 He gave the world premiere of Olympus (concerto for guitar and orchestra) by Evis Sammoutis and the Syrian premiere of Rodrigo’s two masterpieces Concierto de Aranjuez with the Syrian National Symphony Orchestra and Concierto Andaluz with the Syrian Philharmonic Orchestra. Ayman’s international performances include concerts in New York, London, Edinburgh, Brussels, Madrid, Bonn, Berlin, Beirut, Amman, Tunis, Khartoum, Valletta, Cairo, Alexandria, Istanbul, Basel, Prague, Budapest and Taipei, the last attended by the Taiwanese President. He has appeared on many TV channels in concert broadcasts and interviews. In New York, he gave a concert to standing ovation at Carnegie Hall’s Weill Recital Hall as winner of Artists International’s Special Presentation Award. His highly acclaimed studio recording of the program is available on CD. Ayman holds a Master of Music degree from The Juilliard School in New York and a Bachelor’s degree from the Royal Conservatory of Music in Madrid. He served on the faculty of the High Institute of Music in Damascus, Syria and has lived and taught in the UK, Spain, Sudan, Belgium and the US. Ayman was born in Damascus, Syria and now lives in Scotland. He is involved with many charities working to help refugees and people affected by the war in Syria. His repertoire includes works with Spanish, Latin American, Classical, Middle Eastern and Modern flavors. He plays an instrument made by Egyptian luthier Jean-Paul Haggar.